AOA's Seolhyun shared photos from her 'Carefree Travelers' (also known as 'Around the World Travel Package') filming in Europe! It was previously reported that Seolhyun traveled to Europe as the first female solo guest of the JTBC variety show. Seolhyun and the four MCs - Kim Yong Man, Kim Sung Joo, Ahn Jung Hwan, and Jung Hyung Don - are visiting France and Switzerland for a week. With Paris as their first stop, the crew landed safely just a few days ago. Meanwhile, on her Instagram, Seolhyun updated fans with some photos from her current trip, realtime! 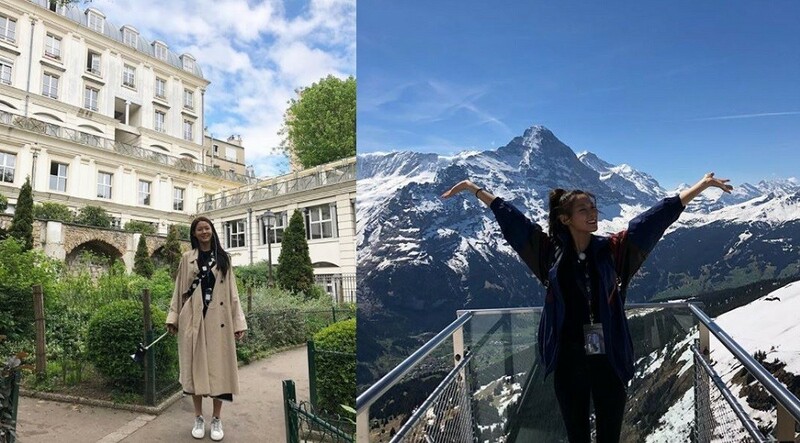 Check out adorable photos below of Seolhyun going around Europe, writing "AOA" in the ice near Grindelwald (First) summit in Switzerland, and more!